"This recipe was modified from food I ate while in Cameroon. This is traditionally served with a whole grilled chicken and grilled potatoes and plantains. You eat everything with your fingers! (it tastes much better that way)." Heat the olive oil in a wok, or large frying pan over medium-high heat. Add the mushrooms and onion, and saute until they are about halfway done. Dump in the spinach, and liberally sprinkle with garlic powder. Fry until the spinach has wilted, about 5 to 7 minutes. Couldn't have been simpler, and was a great spin on a spinach side dish. Excellent!! While easy to prepare, this was lacking something. I added a lot of garlic powder but it still needed salt, pepper and then I finally added bacon. Won't be making again. 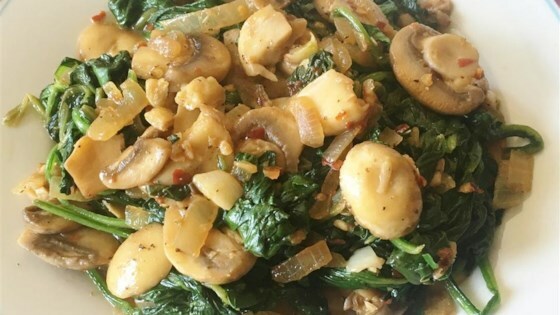 Looking for a different way to use my shiitake mushrooms, I decided to try this recipe. It was so good, my bf loved it. I also tried adding squares of aubergine and it was soooo delicious!